The game of weiqi is reputed to be 4,000 years old. There are mentions of a similar game called yì 弈 made by Confucius and Mencius but it is not certain it is the same game. The name 碁 ‘Go’ comes from its name in Japan. Like many Japanese traditions it was adopted from China during the Tang dynasty when Chinese influence was at its peak. Because it made its way to the West via Japan it is the Japanese form of the game that is most widely played. The game which can be literally translated as ‘encirclement game’ was long considered an appropriate study for scholars as it taught many kinds of strategy. Rules of Weiqi are extra-ordinarily simple, it is played on a board 19x19 lines, and like Chinese chess the pieces go on the line intersections not the spaces in-between; there are 180 white pieces and 181 black pieces. Black starts first and then the players take it in turn to place one piece into an unoccupied place on the board until all the pieces have been played. There is nothing special about a 19x19 board, smaller sizes are used by beginners. A 19x19 board size has been found from the Sui dynasty, so this size has been in use for over a thousand years. Once placed, the piece never moves again but it can be captured by the opponent. A piece is taken (eaten in Chinese 吃 chī) when it and immediate neighbors are completely surrounded (diagonal neighbors do not count). When all the pieces have been placed the areas captured by each player are counted up, the player with the largest area wins. This is the Chinese method of scoring, the Japanese have a slightly different scheme based on number of captures. The starred pieces can be captured. 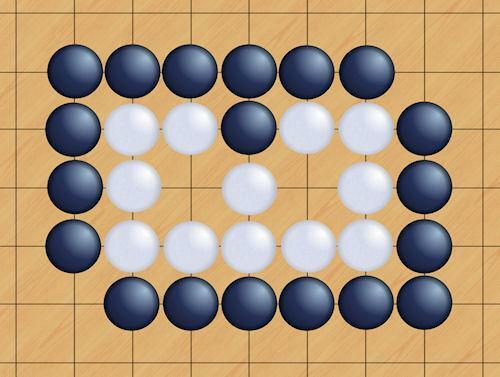 Two black pieces are surrounded by whites. The starred white piece on the edge of the board can be captured as it is also surrounded. The skill is to surround your opponent's pieces without exposing your own pieces to capture. As there is no random element from throwing a dice or tossing a coin, luck plays no part, it is a game of pure skill like chess. To cope with the special cases of corners and edges, each piece has a number of ‘breaths’, in the middle it has four breaths 气 qì but only three on the edge and two at the corners. A piece is captured when it has no breaths left - all neighboring squares are occupied by an opponent. 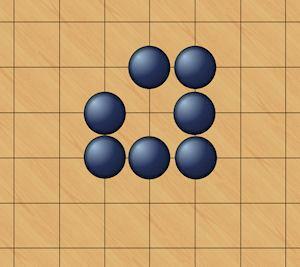 The black pieces form an ‘eye’ (enclosed empty place) which prevent white from invading the immediate area. The space in the center can not be taken by white. As with the game of chess, a key aim is to misdirect your opponent to overlook a potential threat or else a feint, when stones are sacrificed in order to capture more stones in a subsequent move. It is easy to see how the game provides excellent grounding in military strategy. For many years the game proved more difficult for computers to play than chess. This is because there are so many possible moves, all unoccupied squares need considering at each step. It was only in March 2016 ➚ that Google's AlphaGo beat the top ranking Go champion Lee Sedol ➚. Over thousands of years a number of standard strategies have developed. One of the key features is to develop patterns of pieces that are both defensive (unable to be taken) and offensive (threatening to take). The ‘eye’ 眼 yǎn is very important, it is a semi-enclosed group with one or two empty places. A single eye is vulnerable to attack while an arrangement of two eyes is permanently safe. 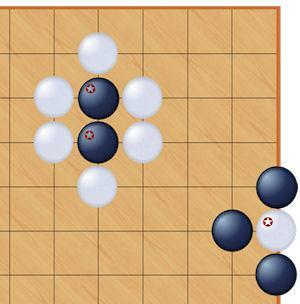 It might be thought that black's encirclement of the white stones is bound to lead to capture of this area. However, as long as white does not fill the eyes the area is safe for white. If black puts a piece in either of the two eyes it would be immediately taken, and suicidal moves are forbidden. 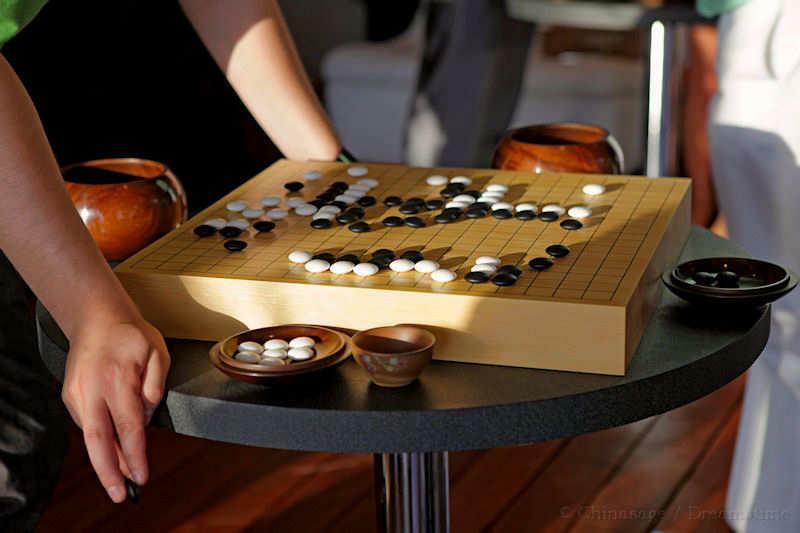 Citation information for this page : Chinasage, 'Game of Go or Weiqi', last updated 2 Dec 2016, Web, http://www.chinasage.info/go.htm.